Of 7,377 WW2 Lancaster bombers built only two survive, one in Canada and the other in England as part of the Battle of Britain Memorial Flight. 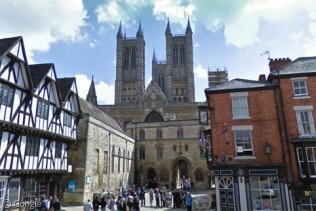 Last month a keen-eyed Google Earth user managed to find the English bomber, the City of Lincoln, flying over Huntingdon and this same image is now available in Google Local. There’s loads of ground level photos on airliners.net and more on the plane from the RAF. Looks like this is used as storage for cars aswell (see Whipsnade thread). Bomber probably heading for this less scary looking airbase. Must of been pretty hard to find, but the cammo looks effective when zoomed out abit. Anyone found the shadow? this will probs have taken off from the IWM at duxford. As a citizen of this exact area, I am quite proud of the amount of cool things being found in my particular area. The old restaurant was called the Megotron, and it had little robots serving you food rather than waiters and waitresses. It was amazing. McDonalds bought it, although it’s no longer than anymore, they sold it about a year ago. The McDonalds used to be called MegAtron. :P. There’s a ground level shot and an interior shot here. I went for a birthday party there when i was really young, i’ll see if I can find the pictures.